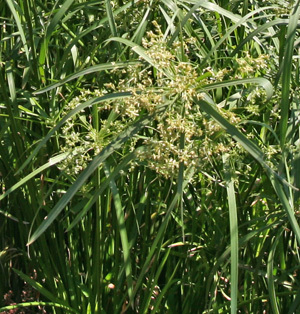 Papyrus is a sedge that naturally grows in shallow water and wet soils. Each stem is topped with feather-duster-like growth. around the southern Mediterranean where it occurs in vast stands in swamps, shallow lakes, and along stream banks throughout the wetter parts of Africa. The large, dense populations often line bodies of water. In ancient times it was widely cultivated in the Nile Delta, but now is nearly extinct there. The starchy rhizomes and culms are edible, both raw and cooked, and the buoyant stems were used for making small boats. Upright stems topped with airy foliage gives this species a tiered effect that is quite ornamental. New shoots at the plant base. 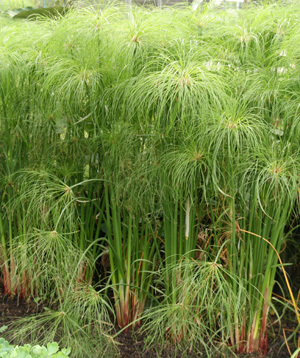 Papyrus is a vigorous grower that can grow up to 16 feet tall in its native habitat, but the ornamental selections are typically a more modest 3-6 feet. This herbaceous perennial produces just a few basal leaves and many strong, deep green, triangular (3-sided) stems (culms) from woody rhizomes. The new rhizomes and culm bases are covered by papery scales, which are actually reduced leaves. These are triangular in shape and a reddish brown color. The thick rhizomes creep horizontally along the soil, anchored by numerous roots. The non-descript, greenish-brown flowers are wind pollinated. Each straight stem is topped with an umbellate inflorescence. This is a dense cluster of many bright green, shiny thread-like rays. Small, secondary umbels with 3-5 rays and narrow, elongated bracts are produced on the ends of the rays. The non-descript, greenish-brown flowers that are produced at the ends are wind pollinated. Eventually brown, nut-like fruits are produced. The mature fruits are dispersed in water after they fall from the plant. This terminal growth, subtended by papery brown bracts, resembles a feather duster at first and will eventually grow to 4-12 inches across. They may become so large that they bend over under their own weight as the cluster becomes almost spherical in shape. 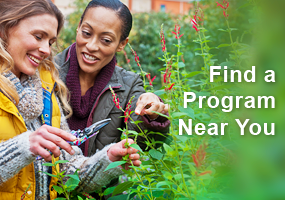 These are often used by birds, especially the social species, as nesting sites in its native habitat. 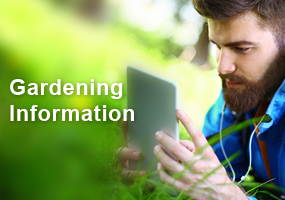 Dwarf cultivars are well suited to container culture. A shorter form than the species is normally available as an ornamental. This is variously labeled as variety ‘Dwarf Form’, ‘Nanus‘, Tutankhamun’ or King Tut®. It grows only 2-3 feet tall, grows vigorously in or out of water, and is more shade tolerant than the species. 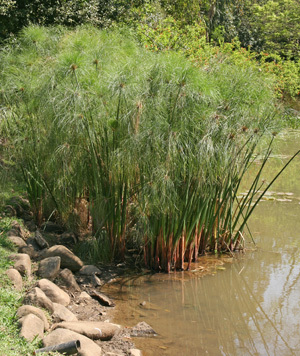 Papyrus can be grown as an annual in the Midwest. 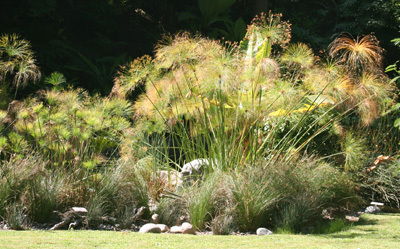 Papyrus can be grown as an annual foliage plant in the ground, in large containers, or in shallow water. The fireworks-like flower heads are a bold and dramatic addition to both the garden and cut flower arrangements. This plant is well suited for medium to large water features and adds an exotic, tropical feel to a sunny corner. Use it as a tall, vertical accent plant with other tropical plants. Because of it’s height it is best used in the middle or back of a bed or container to add drama and contrast to shorter plants. 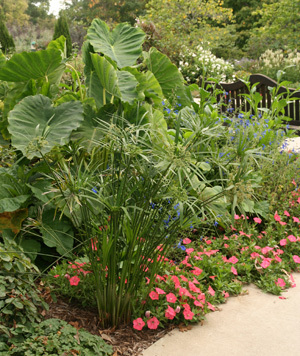 It can be underplanted with annuals such as petunias or coleus, or used as a specimen or an accent in larger landscape beds. 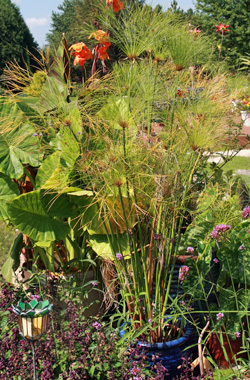 I have one in a container placed behind my water garden that is in a 2 ½ foot tall ceramic pot, and the papyrus towers over the small aquatic plants in the water garden. Papyrus adds a tropical feel to sunny areas. This is an easily grown plant, but needs warm temperatures to thrive. It does best in full sun when grown as an annual in the Midwest. 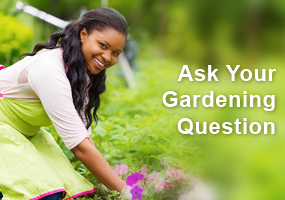 Plant in moist to wet soil or cultivate in a container in order to regulate moisture levels more easily. This plant can be potted in a container without drainage holes. Because of its vigorous growth it can quickly become potbound. Cut off old culms that have browned heads with a sharp knife or pruning shears close to the rhizome. This plant can be fertilized heavily. Propagate by division of the rhizomes in spring. 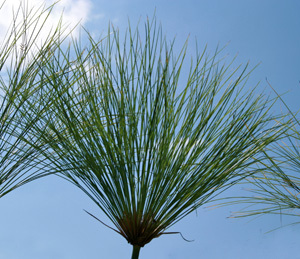 Papyrus is a tropical plant, so must be protected from frost. Because it is of tropical origin, this plant is sensitive to frost, and should be protected or moved indoors when temperatures are below 40°F. 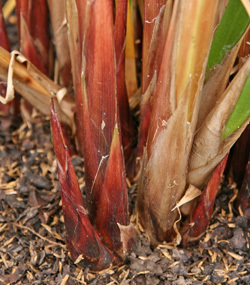 Plants can be kept over the winter as long as the rhizomes are protected from freezing. It will survive – but not thrive – in a bright spot indoors or in a greenhouse over the winter if kept very moist, preferably in standing water (i.e. placing the container in a deep saucer filled with 1-2 inches of water). It may become essentially dormant, but will resume growth with new culms quickly replacing the old, weathered ones in the spring when the weather warms. Seeing this plant featured in large container gardens enticed me to learn more; such a dramatic foliage plant. 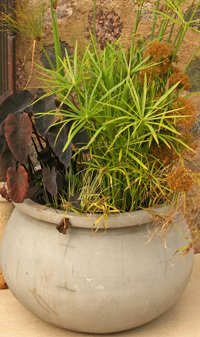 But since it is so water dependent and can be planted in containers w/o drainage holes presents the challenge of finding plants w/ similar water needs if one desires to create an interesting container garden including the papyrus. Will be on the lookout for this specimen in the upcoming growing season. The History note is interesting; that it is best known as the source of ancient paper called papyrus also called Egyptian reed or paper reed. I’ve seen it in the greenhouses but never made a purchase. I added a King Tut to my potted plants this year and really enjoyed it. I did not realize that it grows to 16 feel in native habitat. I also did not know that it grows vigorously in or out of water. I did find out that the 4 wild kittens that were born in my flowers loved the plant so much that they destroyed all the culms. I cut the plant back and it is doing very well now. Why do the “stems” of my potted Papyrus continue to bend in half? I keep it generously watered.